PLENTY of teenagers turning 18 like to celebrate the momentous occasion by hitting the pool. 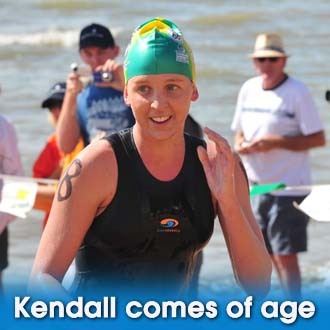 Kendall Messer's big birthday was held on Saturday, the day of the 55th annual Magnetic Island to Townsville Swim. The event was held on the 18th day of the month a coincidence that proved too hard for the Alligator Creek teen to resist not joining in the historic race for the first time. Kendall prepared for the big race by undergoing a gruelling six months of training. ''I was training about six days a week,'' she said. ''I train at Tobruk and I also do gym training sessions with Dale Last.'' She said she was looking forward to celebrating the rest of her birthday just like any other teenager. ''I think I'm going to have a real big sleep, and then a little party tonight with my friends,'' she said. Meanwhile 13-year-old Magnetic Island swimmer Tegan McKeon fought off sea sickness to become the youngest competitor to finish the race. ''I thought I was going to vomit at one stage because it was a bit choppy and I was getting washed around a bit,'' Tegan said. The Pimlico High School student and surf lifesaver arrived in two hours and 32 minutes.